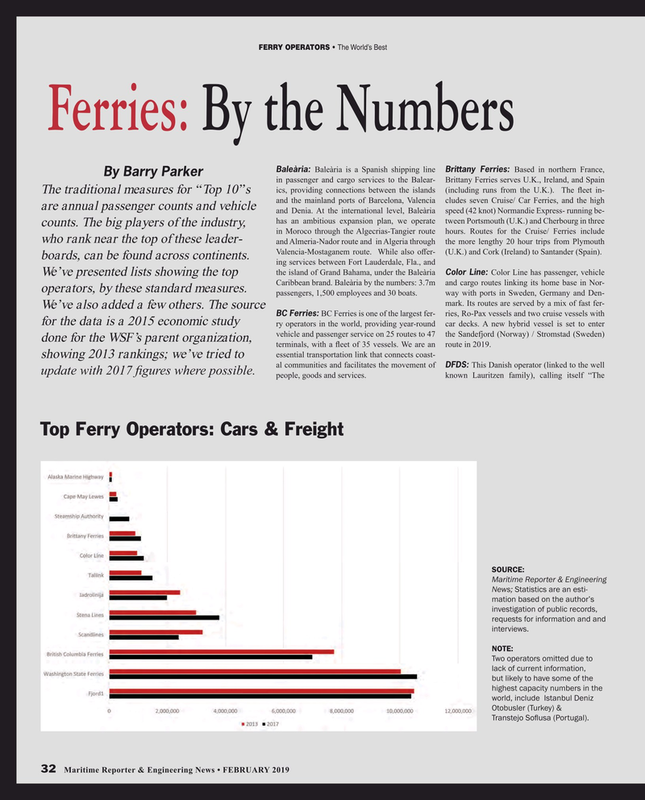 BC Ferries: BC Ferries is one of the largest fer- ries, Ro-Pax vessels and two cruise vessels with for the data is a 2015 economic study ry operators in the world, providing year-round car decks. A new hybrid vessel is set to enter vehicle and passenger service on 25 routes to 47 the Sandefjord (Norway) / Stromstad (Sweden) done for the WSF’s parent organization, terminals, with a feet of 35 vessels. We are an route in 2019. essential transportation link that connects coast- showing 2013 rankings; we’ve tried to al communities and facilitates the movement of DFDS: This Danish operator (linked to the well update with 2017 fgures where possible. News; Statistics are an esti- mation based on the author’s investigation of public records, requests for information and and interviews.